East London’s cabaret scene comes to Walthamstow on Saturday 22 January in the form of Lavender Nights at Ye Olde Rose & Crown. 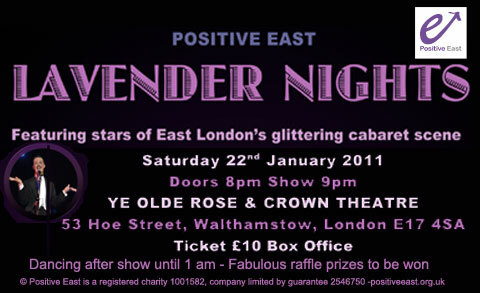 The evening features stars of the London cabaret scene and is in support of Positive East, an East London HIV charity. Burlesque, comedy, music and glamour are all promised, making it sound like quite the night. It is all hosted by Champagne Charlie and if you want to pull some moves and throw some shapes, there is dancing after the show until 1am. Doors open at 8pm, tickets are £10 in advance and available here. All proceeds go to Positive East. The charity has been established for over 20 years and provides practical and emotional support for people affected by HIV, more information on them can be found here.